Need a lift in the morning? Try aromatherapy. Via your breakfast. I am pretty confidant that cinnamon, orange and vanilla is a sure shot way to feel energized, calm, inspired and pretty darn chipper on most any morning. And no need to hold a jar of cinnamon up to your nose and squirt orange juice in your face, nope, this aromatherapy comes straight from your plate. 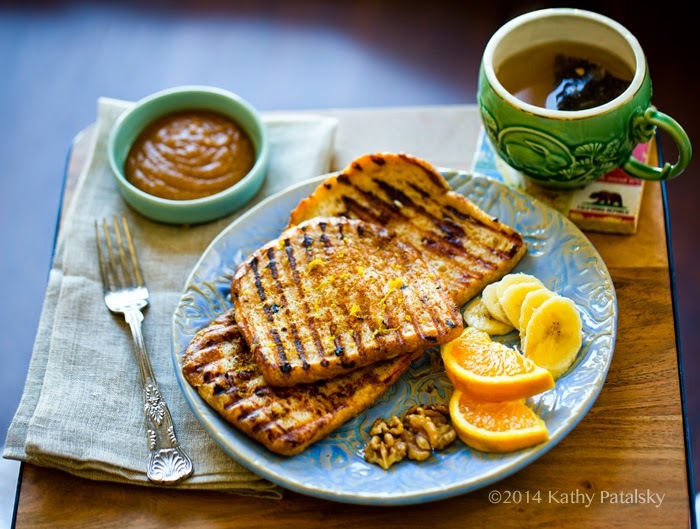 This Cinnamon Orange Vanilla French Toast is infused with those happy morning flavors! Edible aromatherapy? I'm in! 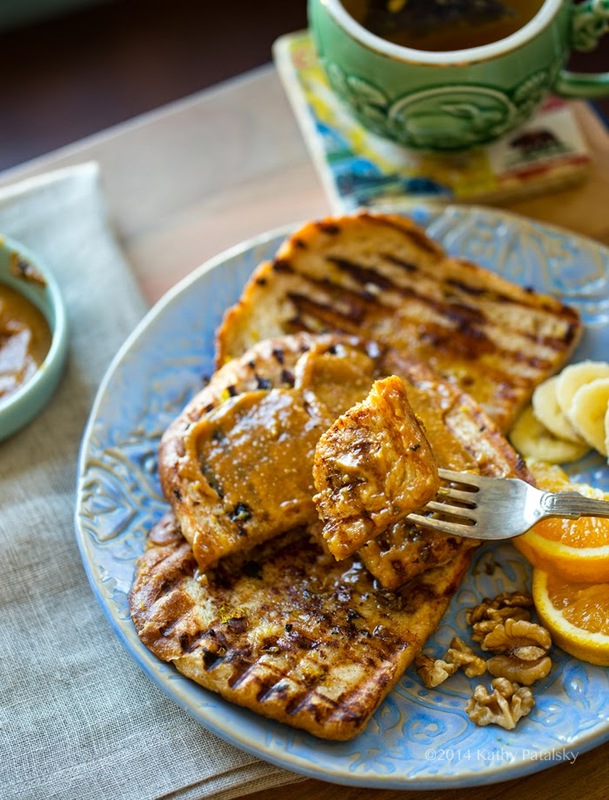 This easy vegan French toast is grilled to perfection, not too soggy, not too rich and just about perfect when slathered in maple almond or peanut butter, some fresh fruit on the side. Maple syrup drizzle, yes do that too. Plus some of my French toast tips!.. 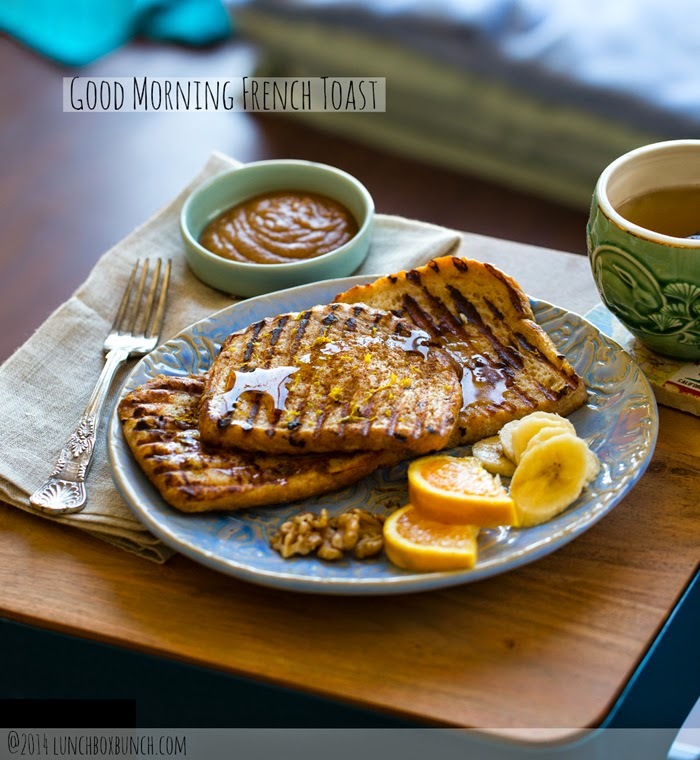 Well good morning, french toast! Grill marks at the breakfast table..
Splurge-y AM. Whenever I think of French toast for breakfast I think of splurge-y brunches. Lazy sunshine filtering through the window while steamy mugs settle on the table and fresh fruit is sliced up in the kitchen at a leisurely pace. 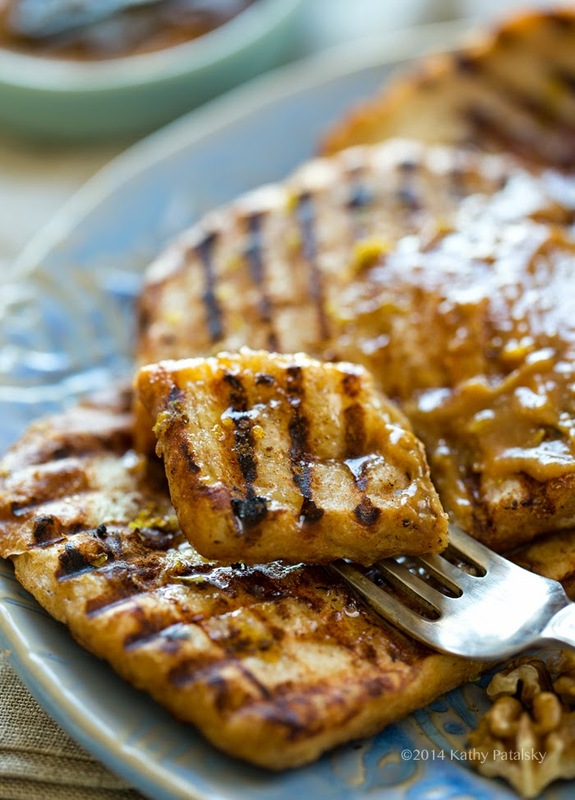 And on a sizzling skillet, pancakes or French toast warm and fluff as they await their appearance on the table, the buttery aromas of breakfast fill the air with cinnamon and happiness. But guess what! 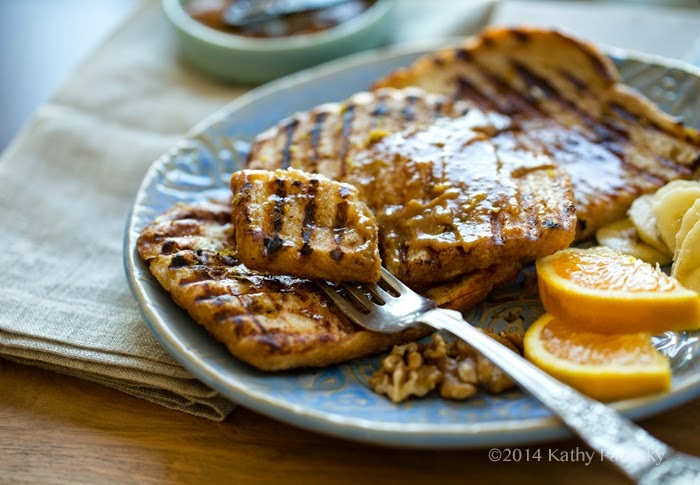 Brunch (while it is perfect for sure) is not the only occasion for this recipe. 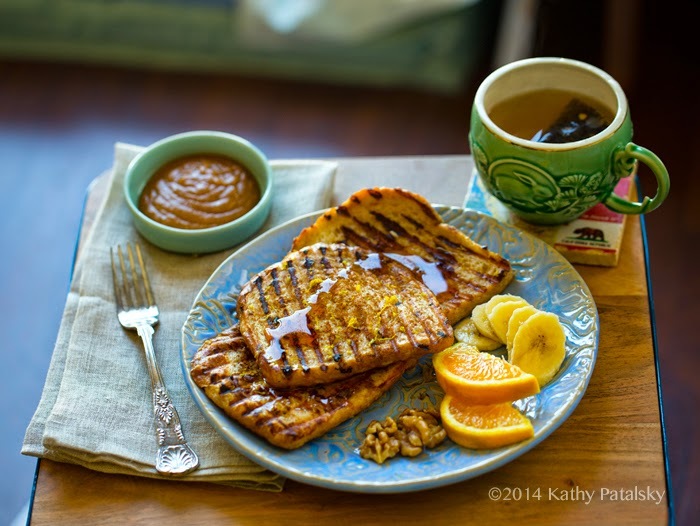 This easy French toast recipe can be whipped up in a flash and make you feel like you are really slowing down on a busy morning. The trick is that unlike pancakes which require mixing bowls and a longer list of ingredients, French toast can totally be a rush job! Just blend, soak and sizzle. Ready to try this one? 1. The bread. Look if you are finding that after several attempts at making perfect French toast (aka FT) you are basically failing, I think I have to problem. The bread you are using is all wrong. Fresh bread is a "no no" when it comes to FT. Fresh or "wimpy" bread will saturate with liquid very quickly, leaving the bread very soggy. Now if you don't mind a bit of sog with your FT, well you are good to go. Day old bread is such an odd term, but it basically means bread that has dried out a bit. Lost its natural fluffiness and is on its way to "stale" status. You want to use dry bread for your FT. I know many of you are doing the gluten-free thing these days, but classic sourdough bread is my all time favorite bread for making FT. You can use crusty sourdough or sliced. Just make sure it has lost its fluff and has a dry look and feel. The perfect bread will soak up plenty of liquid but still keep the outside of the bread relatively dry. I have found that you want the majority of the moisture to be inside the bread, not sitting on top of it when it hits the grill. 2. Cooking. I really loved this FT because it has my favorite thing: grill marks. I made it on my panini press and was excited that it actually worked. I didn't "press down" on the panini until the very last minute of cooking, I didn't want to squish out the moisture, but simply add some texture to the edges to finish things off. One tip for the heating surface is to give your FT plenty of room to breathe and fluff up. Try not to over-crowd the heating surface. Also, a bit of coconut oil helps any sticking that may occur, plus it adds amazing flavor accents and crispy edges. And, do not flip too soon. You want to majority of the cooking to be done on that first cooking side. The bread will fluff up as the bottom surface heats and dries out to crispy perfection. Flipping too soon, and in turn over flipping, may also make the finished product on the soggy and limp side. 3. Cooling. Again, let your FT breathe a bit when cooling. Do not start stacking the finished pieces on top of each other before they have cooled, they will get soggy and limp. Instead, set them side by side. Cooling properly also helps the insides stay moist while the edges crisp up and bit. 4. More Spice! 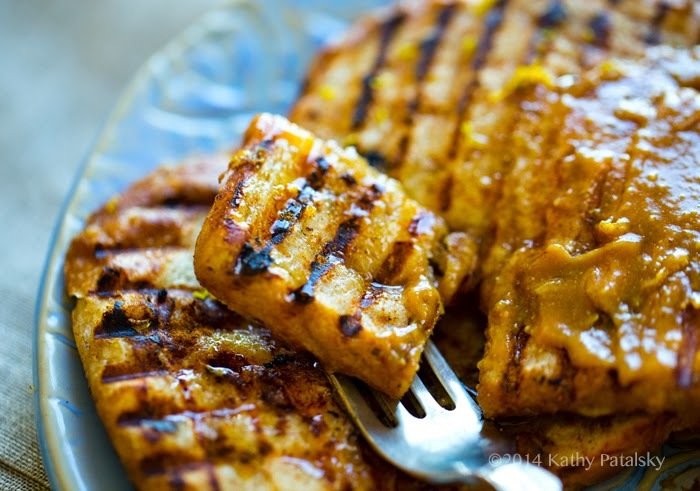 I always add some spices to the top surface, facing up, right after I place the toast on the grill. This adds an extra layer of deliciousness. 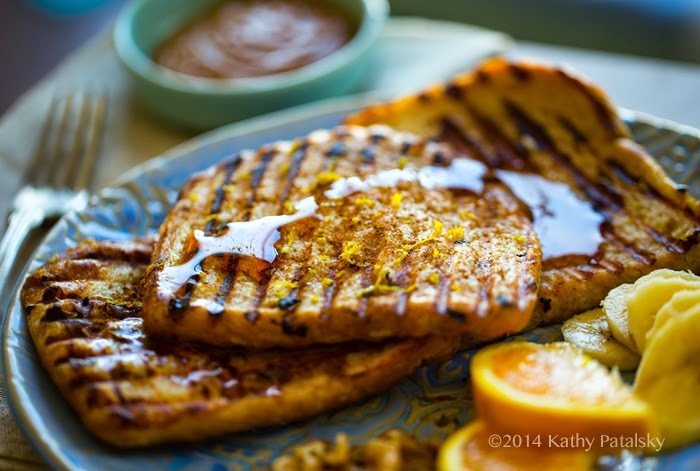 A pinch of cinnamon, orange zest and vanilla bean will ensure that your toast is full of flavor! 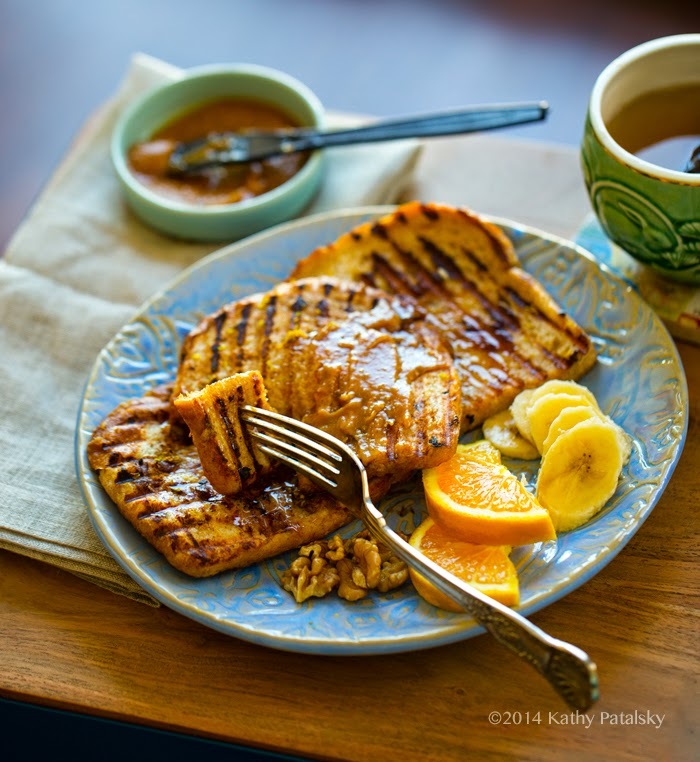 This cozy cinnamon and citrus french toast will wake you up with a smile. Grill marks make it extra special. 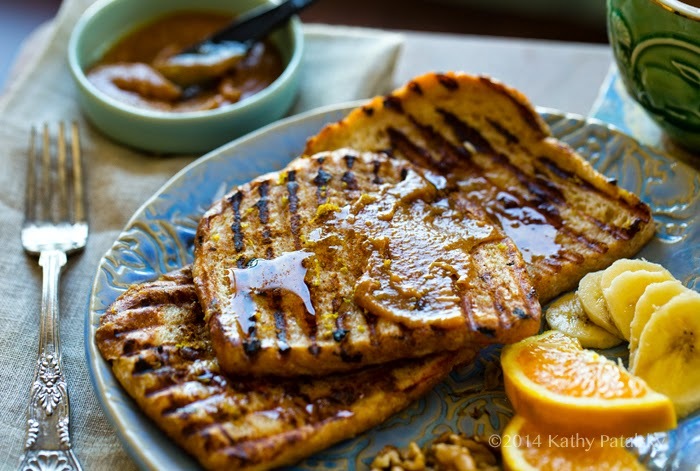 Warm the nut butter and whip it with the maple syrup, set aside. Add the liquid ingredients to a blender and blend until smooth. Pour the liquid into a flat shallow dish like a small casserole dish. 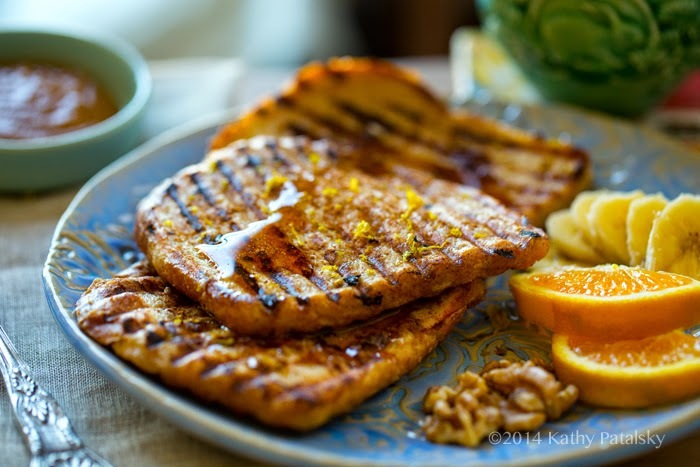 Heat up your panini press or skillet on stove if using traditional cooking methods. When the surface is warm, add a few drops of coconut oil to grease things up. Soak your first slice of bread for about five seconds on each side. Then place on hot cooking surface. 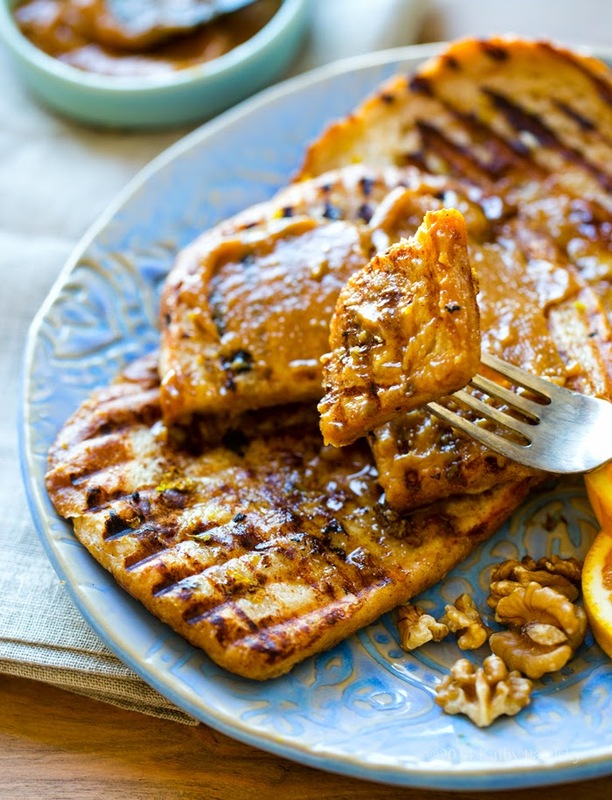 You can cook one at a time or keep adding slices until the grill/skillet is full. Be sure to leave space between the slices so they can "breathe." 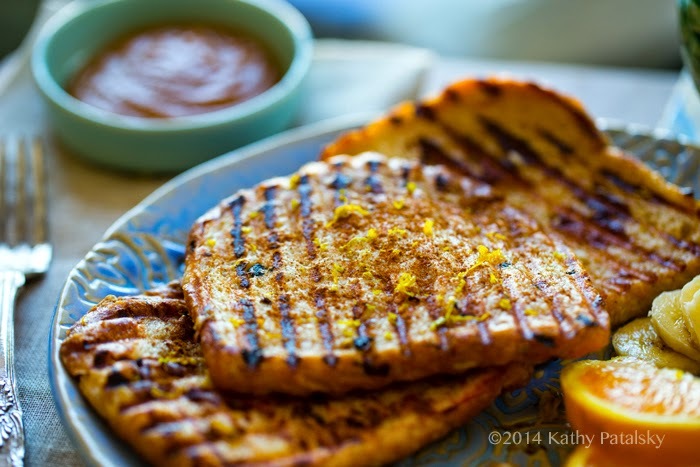 Add a generous sprinkle of cinnamon and some orange zest to the toast side that is facing up. Cook for 2-3 minutes on the first side, then flip using a wide spatula. Cook for another 2-3 minutes. If using a panini press, you can now gently press down for about a minute to really seal in those grill marks. This step is optional. 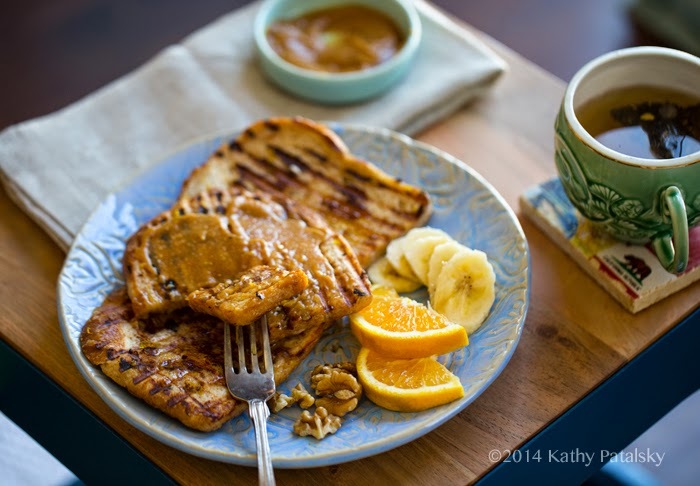 Plate and serve with the nut butter spread and maple syrup.